What is a Nexus read here or continue on. The problem: The Nexus has an internal video switcher but it will not genlock to an external source. Hence a switching glitch in certain cases such as live satellite to internal mpeg video player. If you use a nexus output as genlock it will fix the switching glitch, see this post. But that introduced other problems such as during a reboot as stated in that older post. The solution: A external router with each source genlocked synced and also each audio level can be adjusted independently so they all match both video and audio and no video glitch when switching. Be prepared for the following if you are already using the Nexus. 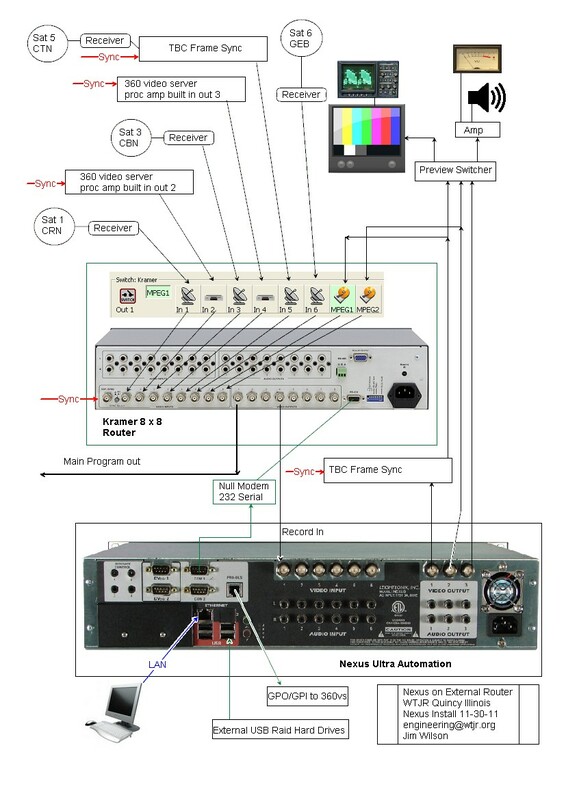 One: is when you go external the inputs and outputs changes, The Six inputs are now invalid, only input 1 is used, the outputs become program 1 mpeg player, program 2 out = preview, program 3 = what is being recorded on input 1. Remember it is not switching anymore internally the external Kramer is doing that under control of nexus..
Two: You will lose your program log and it will need reprogrammed, so print it out, or just redo from scratch. I also had some problems with the library but I was able to fix it without reloading shows. This will take some time so have a backup on air to keep station running programs. Program I used to create drawing Diagram Designer (freeware). You do not need this to view drawings above. I include this so you can make your own drawings. Diagram Designer 1.24 (1.32MB) – Vector graphics editor for creating flowchart and diagrams. It works. The glitch is gone on switches between synced items. The other non-synced items we do not switch direct to air. I notice no switcher time lag. In the drawing the unused Kramer 8 x 8 video outputs can be used for in house distribution. Also some video distribution amplifiers are not show. For example each satellite has it own video monitor. Ingest or capture is still problematic as the Nexus only has one record channel and we use that for time shifting satellite programs a great deal of the time. The solution is a Non-Linear editor computer with capture, the main draw back being it also has to be rendered to MPEG 2 format. The Leightronix solution is the Pegvault we are looking at that very closely. Next Post WTJR Camera upgrade 2012 three cameras for local studio.